Your team has been ticking over just fine. In fact, it’s got to a point where you don’t worry about the people stuff anymore. And then you hire a new member of staff. You thought you’d got it right. You made the introductions. Heck, you even took them out for beer. They all seemed to getting on fine. But then something changed. You barely noticed it happening. But feathers have been ruffled and noses put out of joint. Suddenly your team is antsy. And you don’t know where it came from. It must be the new hire. They’re clearly a bad fit. Bruce Tuckman believes this shakiness in team dynamics is normal. There are four stages of team development. Forming – Storming – Norming – Performing. His research is associated with new teams but can also arise when new members join an established set up. Let’s walk through the stages of Tuckman’s team development model and see if they ring any bells. This is the honeymoon stage. The part when everyone wants to get along. Even if you find something slightly annoying, you brush it from your mind. It’s the equivalent of your new love leaving the top off the toothpaste. Initially it’s a little irritating. But several months on it triggers a full blown row and someone sleeping on the couch. This takes us neatly onto Storming. Now everyone stops being so nice and gets real. They interact more and those little niggles become a real problem. Everyone gets a bit emotional. Emails that shouldn’t be sent hit people’s inbox. Team members take sides. Suddenly you feel you are spending all your time solving disputes over trivial matters. Yes, this may have coincided with your new hire starting. But it may have uncovered wider issues in the team that may have been simmering up to this point. Everyone has found their place and is working at optimum levels. The team comes together to work towards the common goal. How do you repair your team dynamics without casualties? Like with any storm, you may not be able to stop it but you can be prepared. When I first heard about this concept, everything made sense. Share this concept with your team up front. If they know what to expect, it is easier to manage. And when they start ‘storming’ they will recognise it as a phase and try to push through it. I was reminded of this when my daughters headed off on a girl guides trip this week. Prior to the trip they all sat down and agreed a group charter. They discussed what behaviour they felt was acceptable and what to do if certain situations occurred. Now, I am not saying your team should sing around a campfire. However, if you have an agreed charter for your team – meeting etiquette, email response time, communication channels for example – perhaps the little annoyances will be avoided. If you have ever sold anything, you are told to identify the objections of your potential buyer early on and meet them head on. I think the same works here. If you know there could be issues that arise later, tackle them now and agree as a team how you will deal with them. For example, different working styles can struggle to work well together if they don’t understand what makes each other tick. You saw that a skill or discipline was missing in your team and hired accordingly. Good move – but that may give those team dynamics a bit of a kicking too. Let’s say your team is full of ‘big picture’ and ‘just do it’ guys. 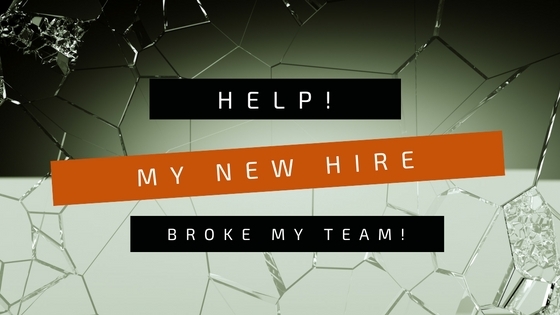 You may have felt the need to bring in someone who would provide systems and structure to the team. That’s smart. But the existing team may feel he is slowing them down with his process flows and documentation. It is important that they understand each other’s strengths, and by combining them they will become a stronger team. Oh and they may need to compromise too. Tolerence and patience is key here. Face the issues head on and find a way around them. This may be nobody’s fault – the team dynamics have changed and they are finding a way to work best together. Don’t ignore it. You can’t pretend it’s not happening. Tuckman states that some teams never make it through this stage. A team that takes root here will struggle to be successful and will be a miserable place to work. Maybe it won’t happen to you? It’s a possibility. Not every team will follow this flow. Tuckman says that some teams go straight from Forming to Performing. However, there is an argument that by skipping the conflict stage, some of the trust building and understanding that comes out of it will be missed. Maybe that old saying is right? What doesn’t kill you makes you stronger.